Costco Wavestorm Paddle Board Review - Great or Garbage? 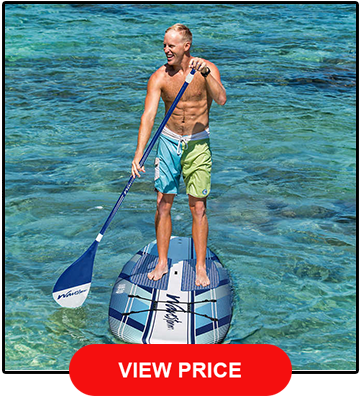 If you’re a surfer, paddle boarder, or have just been to the beach in the past few years, there is no question in our minds that you have come across the Costco Wavestorm Paddle Board. Even if you haven’t seen one, you’ve probably heard of them. For over a decade now, Wavestorm has been sweeping the nation in terms of popularity. The biggest reason is that the boards are mass manufactured, affordable, and can be found at Costco. Their popularity came to rise with their surfboard, a board that was pegged as the perfect beginner board. While true, it was more than that. It left the surf community in awe when we could see the kind of work it was able to put out. Years later, following their surfboard’s success, they decided to put that same mentality into building a SUP. Affordability and accessibility is key here. There is no doubt that they’ve nailed that on the head, though the question you might be asking is “is it a reputable paddle board?” That’s what we’re here to answer. Let’s bring Wavestorm’s Paddle Board out of obscurity. The first thing to note is that this Costco Wavestorm SUP is made out of a high density Expanded Polystyrene Core. Most any beginner paddleboard that you can find out on the market will be built with some sort of high-density foam because it has many positive characteristics for those who are learning. When you start out, there is no doubt that you will end up banging around your board, whether you’re wiping out or letting it glide out into some rocks. The high-density foam will help to lessen the amount of damage that your board takes in comparison to a fiberglass board. This will also help if you are traveling a lot with your board and don’t have a bag or anything around it to protect it. Now obviously it will have normal wear, but you shouldn’t find it cracking or splitting. In terms of the internal durability, it comes complete with three marine wood stringers. These stringers help to increase stiffness on the board and also keep strong when faced with harsher conditions and heavier riders. 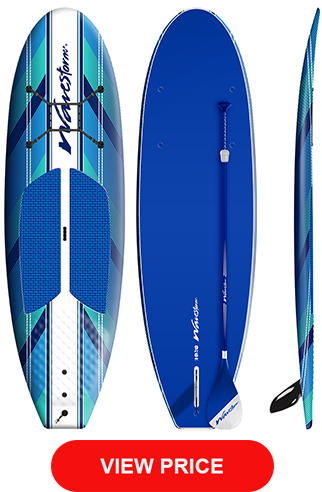 Now while it won’t be as stiff as a fiberglass SUP, you can still ride it with peace of mind that it won’t snap. Wavestorm rates it to support up to 250lbs. Because it is a nice soft foam top, it makes it great board for the little ones to learn on. Paddling around in the waves can be dangerous on a heavily glassed board. You won’t eve have to worry about the board flying back and cracking open a head. On that same note, you little ones should be able to carry the SUP as well. Foam boards are much lighter than fiberglass boards. It just makes transportation better overall. The storage strap is a feature that we really love and we feel like this separates this board from other cheap ones on the market. If you have a waterproof bag with your belongings, a life jacket, or anything else you don’t want to leave behind on the beach, you can easily tie it down with the storage strap and keep it safe with you. The paddle that comes with this board is pretty solid. It is made out of a lightweight aluminum bar that is attached to a plastic blade at the bottom. Most higher end boards these days come with carbon paddles, which are obviously lighter, though this one stands up to them pretty well. It is strong and won’t flex too much with the waves. 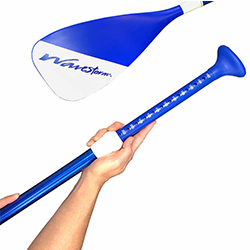 The paddle is also adjustable and is pretty much comfortable for people up to 6.5ft. It’s very easy to adjust and takes only seconds to find the proper length. It comes with a single fin box and plastic fin, which is very easy to install. While you can’t install your own fins, it is nice that you don’t have to worry about the type of fin to get as a beginner. Is it a good board for beginners? Absolutely! This is probably the first board we would recommend for beginners who are looking to get into the world of stand up paddle boarding. 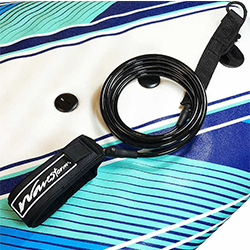 The board is great for a wide variety of conditions, meaning it can be used to glide across the flat water or be taken out to catch some solid waves. It’s also very easy to balance on because of the size and material. How do I stand up on Paddle Board? When you are first starting out, you should make sure that you are in the calmest water possible so you can get a feel for your balance. It may be tempting to head straight for the waves, but that temptation will only lead you to frustration. Make sure that the water you are in is deep enough to where your fin won’t hit the bottom or any rocks. Get to the center of the board and get onto both of your knees. Begin by paddling around here and get a feel for your board. When you’re ready, one foot at time, begin to stand up. Once you are on both feet, make sure they are shoulder width apart and that your feet are facing parallel to the stringers. Slightly bend those knees (not too much!) just enough to maintain a better balance. Now you’re standing! Okay I’m up. Now tell me how to paddle. You should know that there are two basic strokes in paddle boarding: Forward Stroke and Sweep Stroke. Before you begin paddling, keep in mind that your top hand will be used to drive and your bottom hand will be used to angle the paddle. Use whatever hand on top that feels most natural to you. For a forward stroke, you won’t be using much of the bottom arm, so you can keep it pretty still. Extend your paddle in front of you and stick it deep into the water. Many beginners make the mistake of trying to just pull their paddle through the water. Instead, imagine that you are trying to pull yourself and using your paddle as somewhat of a lever. To keep straight, you must paddle a few times on one side and then switch to paddle the same number of times on the other side. Think 3 left and 3 right. Now for turning. Whenever you want to turn a specific direction, place your paddle on the opposite side of the direction you want to go. Get a good strong stance and turn your body the direction you want to go while pulling the paddle towards the tail of the board. For more beginner info, see our recommended guide. Anything else I should know when learning to SUP? Don’t hang onto the paddle with both hands on the shaft. You’re paddling, not trying to mop up the ocean. Always keep your top hand on top to drive the paddle into the water. As we mentioned earlier, keep your feet parallel to the stringers. This means that they should be pointed forward. This is not surfing. Lastly, each stroke should be nice and long. All too often we see beginners out there with short strokes getting tired and frustrated very quickly. The longer the stroke, the less effort it will be on your arms. There are a ton, too many to list here but we recommend a trusted surf and ocean sports travel site like Book Surf Camps to guide you in the right direction and help you narrow down what is the ideal trip for you. How can I carry my SUP? You probably won’t be able to carry your SUP like a surfboard unless you have gorilla arms. The easiest way that works for any SUP is to carry it on your shoulder. Pick up your paddle and lift the nose off the ground. Slowly walk your body back under it until it’s resting on your head. Once it’s there, shift it over to your shoulder. Some higher end SUPs come with handles that make this a bit easier, though the Wavestorm obviously doesn’t provide that luxury. 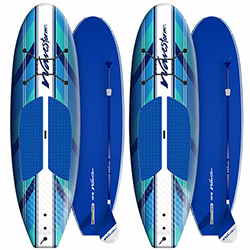 If you are thinking that maybe you want a surfboard instead of a paddle board then this brand also have your covered with their Wavestorm Surfboard. This board is the top of the line and very reasonable pricing, that is why Costco made it their exclusive surfboard that they carry! How do I clean my Wavestorm SUP? 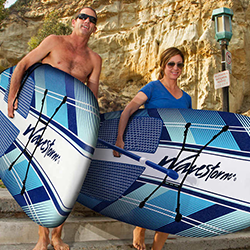 Do I need to wax my Wavestorm SUP? Nope! The foam crosslink deck takes away your need to wax. If you feel that the deck is a little slippery when you first take it out, just try and rub some sand on it to give yourself a bit of grip.